AFC - 08/25/08 Blind for Profit? Despite the availability of numerous modern methods that do not use animals and that have made it possible to test and bring on the market thousands of cosmetic products as safe for human health, more than 30,000 animals are still subjected to terrible and unnecessary testing of cosmetic or household products and their ingredients because of the greed of unethical companies for profit. There is no legal obligation of testing cosmetic products on animals – such tests only protect the producer, not the customer. For the producers, it is a simple way to guard themselves against possible lawsuits. Ethical companies have permanently discontinued animal testing – they test their products by using some of the numerous alternative methods that involve no animals. Gradually, they are bound to substitute all unethical companies, which refuse to take full responsibility for the quality of their products and cause terrible suffering to thousands of animals. In order to draw attention of the general public to the suffering of animals used in testing, Animal Friends will set up an info stall on August 25 in Ulica J.J. Strossmayera in Vukovar. We will distribute the so-called Black and White Lists of companies that do/not test on animals, thereby inviting citizens to stop buying products that have been tested on animals. It will also be an occasion to sign a petition against experimenting on primates. 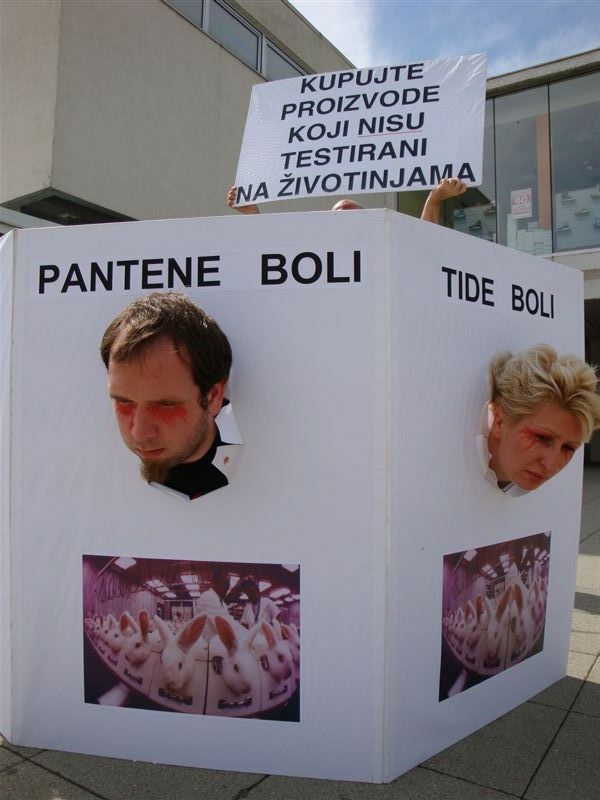 At noon, "immobilized" activists with visible "wounds" on their faces will enact the so-called Draize test of eye irritancy, in which chemicals are applied to the eyes of rabbits, after which they are monitored for several weeks for adverse reactions: bleeding, cornea damage, and blindness. 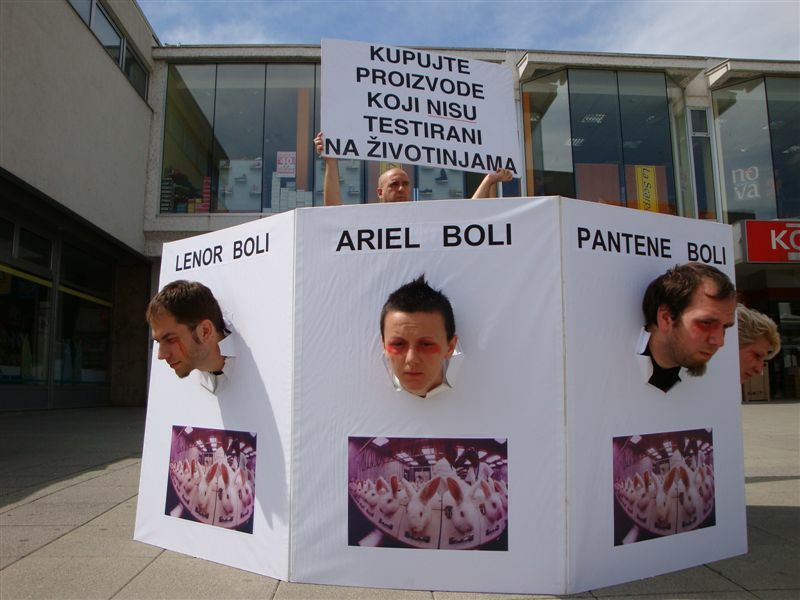 Croatian Animal Protection Act prohibits testing cosmetic and household products or their ingredients on animals, while European Union plans also to discontinue selling cosmetic products that have been tested on animals. Moreover, the European Parliament has been considering the prohibition of experiments conducted on primates. On the same day, at 7:00 P.M., a short film "Wasted Lives" will be shown in the Vukovar European Home, Gajeva 12, accompanied by a lecture and a debate on vivisection, with the purpose of engaging the citizens of Vukovar in the general movement for animal rights. 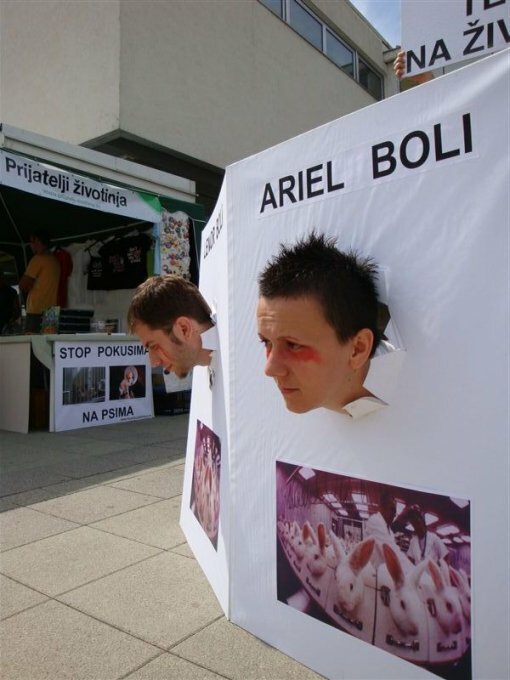 Luka Oman, president of Animal Friends, says: "We wish to draw the public attention to the animal suffering hidden behind famous brands such as Ariel, Max Factor, Olay, Head & Shoulders, and even IAMS companion animals food. Once people are informed about such cruelty, they no longer want to be a part of it and they begin to change their consumer habits. As more and more people join the boycott, we will get closer to saving thousands of animals from painful and lethal tests. 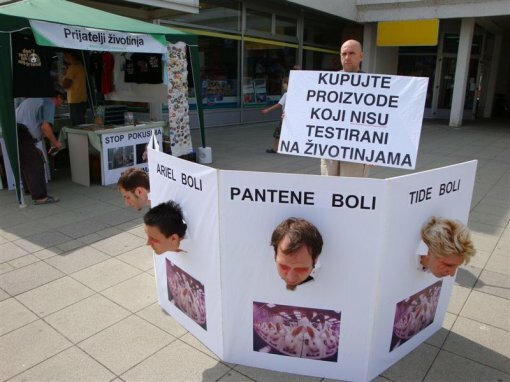 Each and every person can make a difference by avoiding products that have been tested on animals." According to a recently published poll, 80% physicians in the UK doubt the safety of tests conducted on animals. An extensive investigation has evaluated the accuracy of more than 200 research projects using thousands of animals for testing. Half of the tests failed to foresee human results even remotely. Science will not progress unless it completely discontinues using living animals in testing. Many scientists are already using modern, humane testing methods that use cell models and computers. The list of companies that do not test their products or ingredients on animals, but use modern methods that, apart from not harming animals, offer more security for human health, can be found here.